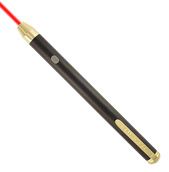 This robust High-Output Laser Pointer is classically styled with a gold finish pocket clip and trim. Durable brass construction is designed for everyday use. The laser projects a bright red dot that is very effective for meetings, lectures, briefings, and inspections. 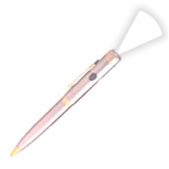 This pointer makes an excellent promotional gift or corporate incentive when engraved. Click here to see your engraving and imprinting options. We are commited to providing our customers affordable, high quality lasers and outstanding customer service. Questions or Concerns, call 1-800-975-1575 or email us.